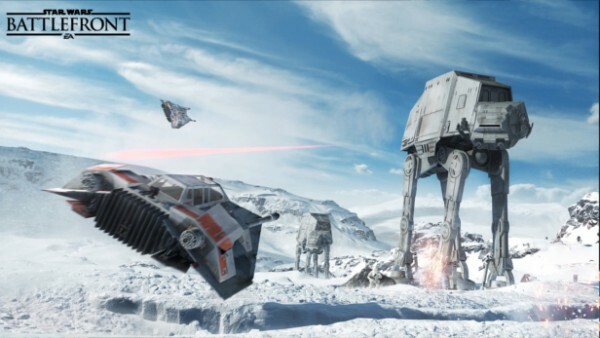 STAR WARS: BATTLEFRONT Review | Warped Factor - Words in the Key of Geek. 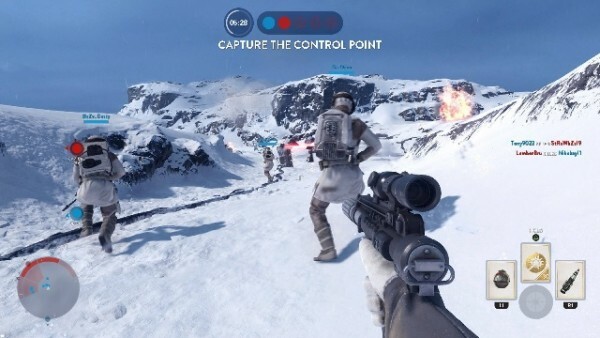 Jake Oh gets to grips with Star Wars: Battlefront. The best way to imagine Star Wars: Battlefront is to think of a toy box. A toy box full of characters, locations and weapons from the series’ best era, that can be laid out in front of you to create bizarre, unrealistic scenarios. Ever wanted to see Palpatine smack force lightning into the face of Han on Endor? No? Me neither - but if you swing that way, you can make it happen. It’s a very good looking toy box, too. If you have the privilege of owning a mildly powerful PC, it’ll look better on that – but for all the people ’stuck’ playing on a console, you won’t be missing out too much. In fact, you’ll be getting a smooth 60fps (most of the time), and the absolute best audio-visual Star Wars gaming experience you can get your hands on. It’s that experience that shines through the game, because for its many flaws, there are moments within that grab hold of you – make you feel as if you’re taking part in an actual Galactic Civil War battle. It can be frustrating, exhilarating, and addictive all at once. That’s why Star Wars: Battlefront also gains the title of being the best Star Wars battle simulator I have played. It’s also a game that’s going to get bigger. You shouldn’t buy it now. You should wait for it to get bigger. When I learnt that DICE were going to create a new Battlefront game, I was pretty excited. These are the guys that create Battlefield, and although I’m not a huge believer in online gaming, I know that Battlefield 4 has become an exceptionally competitive and polished game since its ridiculously buggy launch in 2013. In a way, I was expecting Star Wars: Battlefield. That’s not quite what we got with Battlefront; it has instead managed to carve out its own identity beyond a sci-fi-style coat of paint. 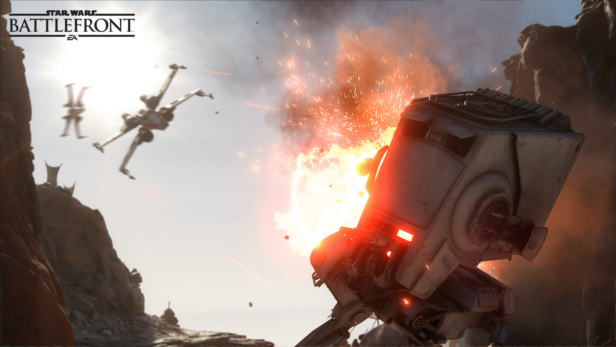 Battlefront is an easier, more accessible game than DICE’s previous efforts – with good reason. Many fans of Star Wars aren’t the same fans that play furiously paced FPSs in a darkened room, with a headset on, cursing loudly at incoming smart rockets. The game is easy to pick up and start playing online from the get-go. You don’t even have to feel guilty about being a terrible player – the leader boards may expose you for your inexperience, but there’s no voice-protocol embedded in the games, so you can remain in blissful ignorance when you leap into the heat of battle without a clue what to do. Accidentally stepping into the middle of a shoot-out isn’t unusual, either. It’s particularly easy to get lost in the maps of Battlefront, such is their fantastic presentation. Each of the 12 maps are gloriously detailed, and can make for incredibly interesting battles due to their unique and diverse structures. 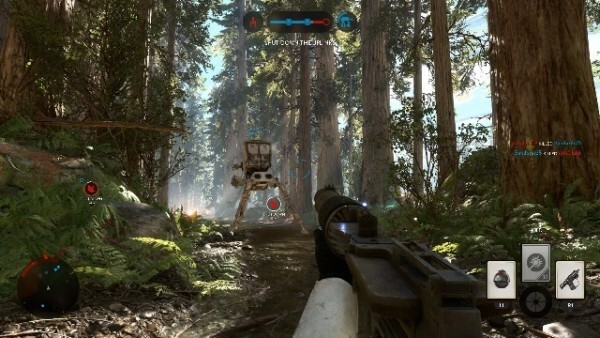 The forests of Endor can provide great camouflage, but when the same game is switched to a map like Hoth – a more exposed setting with hidden ice-caves - the entire gameplay experience can change with it. The music isn’t quite as good. The original pieces blend in well with the bits from Williams' actual film score – but I’m a little tired of hearing the same section of Asteroid Field over and over again. In many ways, this is an online shooter that’s made to feel more like Star Wars than it is an online shooter. You won’t be getting a barrage of content, or 64-player online mayhem (the game is limited to 40-player lobbies, which still feels substantial). This is where the flaws of the game start to creep in a little. In the effort to create an authentic experience for fans of the universe, DICE have sacrificed some aspects that make an online shooter great. There are a pretty good number of multiplayer modes (9 at launch), but most of them are just a bit terrible. The modes built around the game’s heroes (Luke, Han, Leia/Vader, Palpatine, Bobba Fett) are fun to watch, but the complete change in weapon structure feels out of place and insubstantial compared to the epic shooting barrages of the Supremacy and Drop Zone modes. There are some gems in the game modes, though. The aforementioned Supremacy mode is fantastic – as two teams of 20 players battle it out the take control of an outpost on the game’s biggest maps. Power-ups and vehicles aplenty keep the games varied and interesting, despite the limit of only four maps. Walker Assault deserves a special mention, too – an interesting concept that forces rebels to defend against an incoming empire AT-AT by searching and activating relay stations, allowing the AT-AT to become susceptible to attacks. Beyond the scope of online gameplay, DICE seemed to have shoe-horned in a number of single player options. There’s a handful of training missions to get started on if you don’t fancy jumping directly into the main game, and then you’re left with two game modes – Battles and Survival. Battles can be a somewhat repetitive experience – as you face a continuously spawning group of enemies, pick them off, and collect points from them. The enemy AI can collect points from you too, and from your own AI – which can be a little frustrating (particularly in harder modes) as your own performances can be completely negated by a sudden burst of points given to the enemy team due to the stupidity of your own AI. You can turn this AI off, but then you can’t gain any of those precious, precious stars, which completionists (like me, and Mario) feel they must achieve! The friendly AI can hinder you in other ways, too. They always seem to be in a rush to get somewhere, and have a habit of dragging you 50 feet into the middle of a skinny corridor you didn’t want to be dragged down, only to be shot at and killed as your positon becomes compromised. It’s not quite the wet sandwich allured to in my previous Battlefront article, but it’s difficult to contain your anger when this happens in the harder modes, which require sniper-like precision to complete. Survival mode is pretty great! You face off against 15 waves of enemies in a map of your choosing. The difficulty curve is a little on the low end at first, and it isn’t until about two-thirds of the way through that things get more challenging – but those last few waves can be exhilarating. Rushing to grab a life from the forest floor before the final wave arrives is intense, especially when those lives are shared between you and a friend. 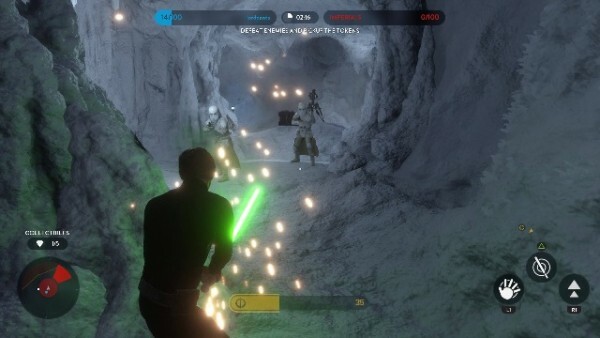 Both these modes can be played in split-screen co-op, and like the previous Battlefront games, local multiplayer can be a joy to experience – it’s just a shame the framerate halves in the process. Dropping from the smoothness of 60 down to 30fps is noticeable, and a little disappointing. Other than these two modes, single player is non-existent. In most games, this is something I would bemoan – but I always found the previous games in the series to have a subpar story-driven mode. Besides, who plays Battlefront for the story? That’s what Knights of the Old Republic is for! My main problem with Battlefront is that we already know it isn’t complete. There’s a good amount of content, but not enough to sustain experienced players of online shooters. EA has already announced the looming presence of four expansion packs – turning Battlefront into a The Sims: Star Wars series (personally, I can’t wait for Battlefront: Hot Date!). Clearly EA knows that the content simply isn’t enough to sustain players long term. Instead, you’ll be asked to buy expansion packs individually – or pay an extra £40 now to gain access to them when they arrive (please, for the love of video-game-gods, don’t buy a season pass). I’m looking forward for these packs, because it means my toy box is going to expand, and maybe I can get Jar Jar’s tongue stuck on Vader’s cape or something. Until then, we’re left with a game with amazing moments, but one that ultimately feels like it isn’t finished. Journalist, optimist, and gamer - Jake is usually the biggest Zelda fan in the room. He also tweets and eats Jammy Dodgers, almost always at the same time.